We take an approach based on tried-and-true tactics that we've developed during our years of practicing bankruptcy law. From day one you will have an attorney working on your case with a team of paralegals. We do not simply go through the motions, filling out the necessary forms like many bankruptcy mills. We consider all possible legal options for you, with some options that may even lead to us getting money back for you! Our Montgomery, Lancaster, Chester and Berks County debt relief law firm practices in: Chapter 7 bankruptcy Taxes and Chapter 7 bankruptcy Chapter 13 bankruptcy Taxes and Chapter 13 bankruptcy Consumer Rights Protection Foreclosure Avoidance Stripping Second (or Third) Mortgages Bankruptcy Alternatives including: Mortgage modifications Non-Bankruptcy Workouts Contact Our Pottstown Area Bankruptcy Attorneys Today Our attorneys are ready to discuss your concerns and provide answers. Our attorneys represent clients in Pottstown, Norristown, Lancaster, West Chester, Reading, and all surrounding areas. Contact our Pennsylvania debt relief law firm today to learn more about what we can do to help you overcome your legal troubles at 610-323-5300. Attorney Joseph Quinn graduated from the Pennsylvania State University at University Park. While working full-time for an international company, he graduated from the Beasley School of Law at Temple University, where he focused on Taxation and Bankruptcy. Attorney Quinn spent time working with Consumer Bankruptcy Assistance Project (CBAP), performing pro bono bankruptcy work for residents of Philadelphia. Because of this and other public work, Attorney Quinn was named as a fellow of the Rubin Public Interest Law Honor Society at Temple Law School. When not in the office, Attorney Quinn enjoys spending time with his family in West Chester, Pennsylvania. Graduated from Bloomsburg University of Pennsylvania with a degree in Finance and Accounting and began working at the Investment Management firm of The Vanguard Group where he worked approximately eight years. 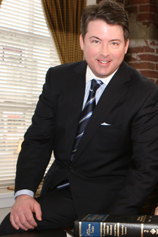 While working there full time, he graduated from Widener University School of Law. While there, he served an externship for the Delaware County District Attorney's office and a clerkship for a judge at the Chester County Court of Common Pleas. From there he worked in the litigation department of a large multinational firm in Philadelphia and thereafter began Stephen Ross Law, LLC., in 2005. Stephen Ross is also a veteran of the United States Army where he proudly served as a combat engineer.